Controlled Parking Zone in East Dulwich - have your say! Love it or hate it? Now is the time to express your views as Southwark Council have once again raised the prospect of a CPZ stretching from East Dulwich Station all the way across to Barry Road, up to The Plough and over to Dulwich Park. 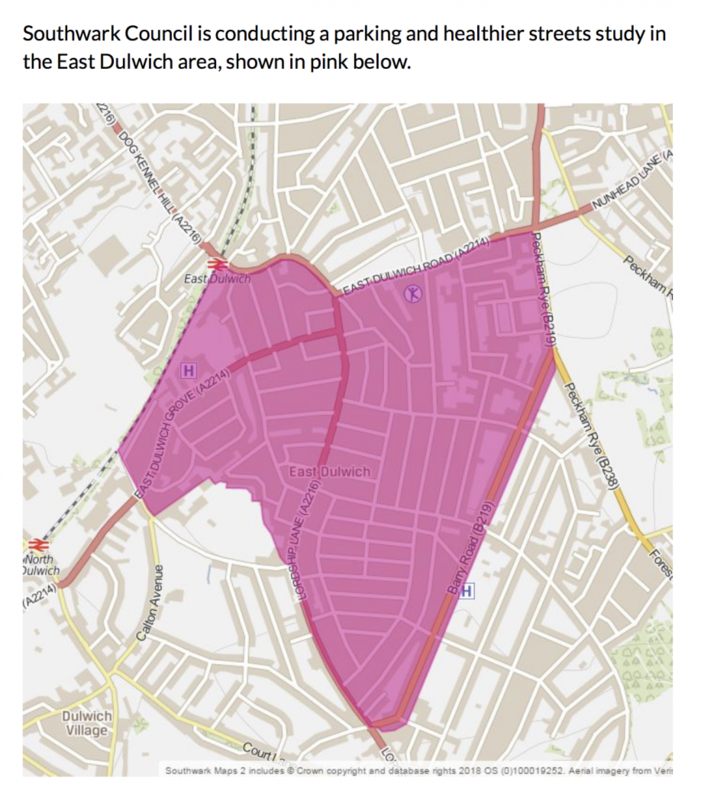 There is no doubt that there are occassions when it can be tricky to find a parking space in East Dulwich, although as one who does so regularly I can honestly say it is rare not to find a space in a couple of minutes, 5 at the most. For local businesses, facing the prospect of vehicle permits costing £575 per year, per vehicle, and fewer shoppers on Lordship Lane as they turn to the easier option of free parking at local supermarkets this feels like it may just be the final nail in the coffin. With ever rising Business Rates (many on Lordship Lane have doubled in the past year) and the unknown effects of Brexit looming this is a worrying time for the many small, local businesses that have made Lordship Lane what it is. It seems now they may be victims of their own success, as the area has grown into a unique and vibrant community with a high street that is the envy of many other boroughs, so house prices have increased and more affluent people have moved into the area, and with them more cars too. Having seen the decline of other high streets where CPZs have been implemented, and news of shops closing in the press on a weekly basis it seems madness to change anything about Lordship Lane right now – why risk ruining a road that is regularly used as a case study, and hailed as “Britains Best High Street” in the press? At a meeting with Southwark Council last Tuesday, 22nd January at Goose Green Community Centre around 100 traders turned up (despite the meeting being in the middle of their working day) to voice their concerns. Many of them are also local residents and regardless of this they do not want controlled parking. When a compromies was suggested, whereby different roads had parking restrictions at different times during the day – e.g. 11am-1pm in one area, and 1pm-3pm in another area, the council stated that this ‘wasn’t possbile and that the entire area would have to have the same time restriction. This directly contradicts with the councils claim to be ‘willing to listen to, and work with local businesses to ensure a CPZ doesn’t have a negative influence on the high street’. With few paid parking spaces for visitors during the restricted times you’d see empty streets where shoppers are unable to park, and an empty high street too. Whilst we appreciate the need to deter commuters from parking all day on local roads to catch the train into town, we don’t feel that the councils proposals will fix this issue. The restricted areas will offer paid parking, which can be booked and paid for by mobile phone from anywhere – so commuters can still park and simply pay for the 2 hours in the middle of the day. It would be amazing to see Southwark Council lead the way with a new approach to parking, whereby there may be a 2 hour time slot during the day when parking is restricted to 2 hours FREE parking, on the basis of a ticket, issued from a machine (not bookable online), with the machines only issuing tickets within one hour of the restricted hours. This would have the same effect of deterring commuters and freeing up parking for local residents, without the need for parking permits, and is in line with the recommendations in The Portas Review. The best way to make your own views known is to follow the link below to the Southwark Website where you will find more information, and a link through to a survey (click on the “Have your Say” button, and then scroll down to ‘Give us your views’ ). If, like us you are against the CPZ then thank you for your support – we know that not everyone will be, but for me – as a born and bred East Dulwich Girl – employer of many local people, and owner of a small local business, that HAS to run 3 refrigerated vans in order to stay in business it is a really worrying prospect. Love it or loathe it please have your say by filling in the survey……..